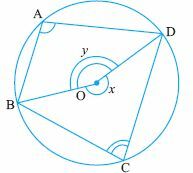 Cyclic Quadrilateral: A quadrilateral whose vertices lie on the circumference of a circle is called cyclic quadrilateral. Theorem: Opposite angles of a cyclic quadrilateral are supplementary. Q 7: Prove that the exterior angle of a cyclic quadrilateral is equal to its interior opposite angle. Q 8: A pair of opposite sides of a cyclic quadrilateral is equal. Prove that their diagonals are equal.